Do NOT call it a comeback BUT after enthralling us twelve years ago with her critically acclaimed debut album, the Carl Raccah-produced Sahara Nights, for which she was awarded Nigeria’s first Gold Record award by MTN Play and Go in 2003, Greek Nigerian Pop star JOJO - formerly known as Joanne - returns with an excellent new single titled “Let’s Dance” under her new record label Heavy Tunez Records. Receiving its radio premiere today on the award-winning Rhythm 93.7 FM, “Let’s Dance” is a very catch and infectious Pop/Dance record that is sure to lift your spirits and get you in the mood for good vibrations. 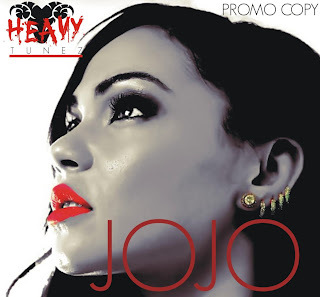 With genuine and heartfelt lyrics that call for peace, love and unity in our nation Nigeria - especially as we presently face extremely trying times - JOJO makes the conscious effort to remain upbeat and portray a positive and uplifting message on “Let’s Dance” without ever coming off as pretentious or gimmicky. All that is left now is for the entire nation to press play and listen to Jojo’s “Let’s Dance” and to let the song’s message which reiterates our strong ethos of positivity and togetherness despite the situation resonate with each and every one of us as we listen! Born in Delta State, Nigeria to a Greek father and a Nigerian mother and raised in the heart of Las Gidi, JOJO has always been destined for greatness. Sadly, she lost her mother before her first birthday but this has not deterred her from becoming the star she was destined to become. Her musical inspiration and influences come from legends such as Celine Dion and Mariah Carey and while JOJO seeks to emulate the legendary status of her inspirations, she remains significantly different and steps ahead of her peers with her own very unique style. After her formative years in Lagos, Jojo moved to the United Kingdom to further hed education but not before embarking on a hugely successful singing career here in Nigeria in 2000 with the release of her debut album titled Sahara Nights which was produced by the world renowed Carl Raccah and brought Jojo much success including the first ever Gold Record award which was awarded to her by MTN Play and Go in 2003. Now back in Nigeria, JOJO is ready to pick up where her career left off before her move to the United Kingdom to study. Her first onslaught on the Nigerian music scene is the infectious Afro Pop single titled “Let’s Dance” which is OUT now!! !